One of the most valuable roles of Rebels is shaking up thinking by challenging group think, accepted assumptions and "business as usual." Teams with diverse viewpoints, approaches to problem solving and life experiences outperform groups of the “best and brightest,” as researchers like University of Michigan’s Scott Page have long shown. BUT diversity isn’t enough. In fact, diversity can contribute to organizational silence, where people hold back from speaking up and offering their ideas. Consider the studies by David Maxwell that found 90% of nurses unwilling to speak up to physicians even though they knew a patient might be at risk. Or the 93% of people who said they don’t speak up when they know there’s a risk of an accident of work. How could they not speak up? Being different is uncomfortable and when we’re uncomfortable we tend to hold back. Especially in cultures that allow abrasive behavior and abusive bosses (and physicians). It’s not safe to dissent, so people don’t. Diversity also increases conflict, which people abhor. Every time Carmen and I speak and ask people about their greatest challenges when introducing new ideas, conflict tops the list. Add to that the research from Harvard, Berkeley and University of Minnesota that found most corporate diversity programs have “no positive effects in the average workplace” because when employees become scared that they might offend someone, they disengage, which contributes to more organizational silence. The reality is that our brains are hardwired to want to be with people like ourselves – and naturally fear strangers or the unfamiliar. (Google “xenophobia” and “amygdala.”) That’s why so many of us naturally gravitate to groups, neighborhoods, and work teams with people like ourselves – and avoid the different. So how DO you create Dream Teams? 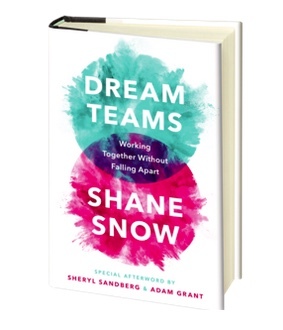 That’s what Shane Snow explores in his excellent new book, “Dream Teams: Working Together Without Falling Apart.” Shane is a great storyteller and weaves together fascinating research and stories from music, business, police forces , sports, and the gaming world to provide ways to embrace cognitive friction. Bring in more rebels: Having a naysayer in a group shakes up thinking in valuable ways. “Dissenting views by a minority of individuals stimulate the kinds of thought processes that lead to better decisions, better problem solving and more originality,” per Dr. Charlan Nement of UC Berkeley. The presence of a minority viewpoint helps groups look at issues “on all sides.” In other words, you need people to provoke group think and kick you out of inertia. Don’t value your values too much: Shared values make us more likely to think the same, stop searching for better solutions once we have solutions that work, and add to organizational silence. “Seven out of ten American employees in companies with strong values hush up when their opinions are at odds with those of their superiors,” according to research by Warren Bennis at the University of Southern California. Cultivate intellectual humility “Intellectual humility makes one more correctly judge when it is time to change” and is a predictor for openness to changing important opinions, curiosity, tolerance for ambiguity, ability to detect the validity of persuasive arguments. In other words, a more open-minded culture needs people with intellectual humility. Activate oxytocin and empathy with stories: “When our brains release oxytocin for a person who is not in our in-group, the bias we have for them disappears. And one of the key ways we can do that is through sharing good stories.” This is why it’s so helpful for teams to share their personal stories, from hardships growing up to who in their life helped them achieve a dream. Read more novels: “People who read a book or more per month, the data shows, are significantly more likely to have high intellectual humility than those who rarely read.” Stories cultivate empathy. I highly recommend Shane’s book. And don’t miss the footnotes.